Entrance fees for the California National Parks vary from park to park. For example, Yosemite’s current entrance fee is $20/car, but no entrance fee will be required if you decide to incorporate a visit to Channel Island National Park on your Los Angeles vacation (although you will have to pay for transportation – either by air or by boat – to the islands). NOTE WELL: Travelers planning to visit the park over the Martin Luther King Jr. weekend must be aware of the possibility of changing weather, resulting in snow or ice on the roadways. Also, please be advised of this Yosemite road closure during March 2012. The National Park Service urges you to call 209-372-0200 for the most up-to-date weather and road condition information. The above fee-free days apply to all National Parks in California and in the other states, as well, and provide travelers on a budget an opportunity to save a little money. It should be noted, however, that other park fees (such as reservation, camping, tours, concession and fees collected by third parties) will not be waived unless specifically stated otherwise. Click these links for other Yosemite vacation ideas or for further information about other Sierras & Gold Country travel destinations you may want to visit while in the area. If you’ve never been to Yosemite, you might want to check out the two-minute introductory video below. It really is an incredible place! 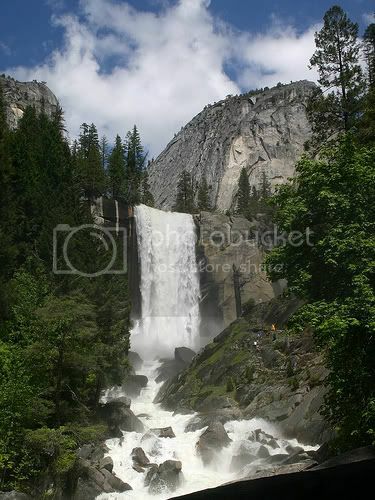 Photo of Vernal Falls by Alaskan Dude via flickr (Creative Commons).